Sepsis accounts for 30% to 50% of all in-hospital deaths in the United States. Other than antibiotics and source control, management strategies are largely supportive with fluid resuscitation and respiratory, renal, and circulatory support. Intravenous vitamin C in conjunction with thiamine and hydrocortisone has recently been suggested to improve outcomes in patients with sepsis in a single-center before-and-after study. However, before this therapeutic strategy is adopted, a rigorous assessment of its efficacy is needed. The Vitamin C, Thiamine and Steroids in Sepsis (VICTAS) trial is a prospective, multi-center, double-blind, adaptive sample size, randomized, placebo-controlled trial. It will enroll patients with sepsis causing respiratory or circulatory compromise or both. Patients will be randomly assigned (1:1) to receive intravenous vitamin C (1.5 g), thiamine (100 mg), and hydrocortisone (50 mg) every 6 h or matching placebos until a total of 16 administrations have been completed or intensive care unit discharge occurs (whichever is first). Patients randomly assigned to the comparator group are permitted to receive open-label stress-dose steroids at the discretion of the treating clinical team. The primary outcome is consecutive days free of ventilator and vasopressor support (VVFDs) in the 30 days following randomization. The key secondary outcome is mortality at 30 days. Sample size will be determined adaptively by using interim analyses with pre-stated stopping rules to allow the early recognition of a large mortality benefit if one exists and to refocus on the more sensitive outcome of VVFDs if an early large mortality benefit is not observed. VICTAS is a large, multi-center, double-blind, adaptive sample size, randomized, placebo-controlled trial that will test the efficacy of vitamin C, thiamine, and hydrocortisone as a combined therapy in patients with respiratory or circulatory dysfunction (or both) resulting from sepsis. Because the components of this therapy are inexpensive and readily available and have very favorable risk profiles, demonstrated efficacy would have immediate implications for the management of sepsis worldwide. First registered on April 26, 2018, and last verified on December 20, 2018. Mark Levine, MD, is supported by the Intramural Research Program, National Institute of Diabetes and Digestive and Kidney Diseases, National Institutes of Health. DK053212-12: Ascorbic acid as a pharmacologic agent in disease treatment. The online version of this article ( https://doi.org/10.1186/s13063-019-3254-2) contains supplementary material, which is available to authorized users. Sepsis is an inflammatory syndrome with life-threatening organ dysfunction resulting from a dysregulated host response to infection . Each year in the United States, where the incidence is increasing, there are an estimated 1,750,000 cases, half of which require intensive care unit (ICU) admission [2, 3, 4]. These cases account for 30% to 50% of all in-hospital deaths, making sepsis the third leading cause of death in the United States and the most expensive reason for hospitalization; annual in-patient expenditure is nearly $24 billion [5, 6, 7]. Those who survive endure significant reductions in physical, emotional, and cognitive quality of life [8, 9]. Current management strategies for patients with sepsis include early aggressive fluid resuscitation, early appropriate antibiotics, hemodynamic support with vasopressors, and the identification and control of infected sites [10, 11]. Although outcomes have improved with the bundled deployment of these strategies [12, 13, 14, 15], mortality remains high at 20–30% [4, 16]. Cost-effective and low-risk therapeutic approaches to reduce the morbidity and mortality of sepsis are needed. For this reason, the 32% absolute mortality reduction observed in a recent study of a combination therapy, including intravenous vitamin C (1.5 g every 6 h), thiamine (200 mg every 12 h), and hydrocortisone (50 mg every 6 h), has attracted significant attention and enthusiasm from the lay press, patient advocacy groups, private foundations, and some clinicians [17, 18, 19, 20]. By contrast, the sobering experiences of more than 100 phase 2 and 3 clinical trials of promising pharmacological agents, none of which demonstrated reproducible benefits among patients with sepsis, have caused others to have a more reserved response [21, 22, 23]. Many providers will await a more rigorous assessment of this three-drug regimen before adopting its use [24, 25, 26]. Although well-designed, randomized controlled trials of the vitamin C, thiamine, and hydrocortisone regimen have not been completed, the reported beneficial effects are biologically plausible. Vitamin C is an essential micronutrient not synthesized by humans , is an enzymatic cofactor in the endogenous synthesis of norepinephrine, and is a well-known antioxidant. Indeed, oxidative stress is part of the sepsis syndrome where an overproduction of reactive oxygen species causes lipid peroxidation, endothelial disruption, decreased vascular tone, and increased vascular permeability [28, 29]. For many years, it has been appreciated that critically ill patients, including those with sepsis, routinely have very low plasma vitamin C concentrations (<15 μmol/L) [30, 31, 32, 33, 34]. Even when circulating concentrations of vitamin C reflect adherence to recommended dietary intake (~50 μmol/L) , the activation of complement-mediated inflammation may lead to inadequate intracellular concentrations . In animal models of sepsis, intravenous repletion of vitamin C improved arteriolar responsiveness to vasoconstrictors and capillary blood flow and decreased microvascular permeability and organ dysfunction [37, 38, 39]. In models of lung injury, vitamin C improved epithelial barrier function and alveolar fluid clearance and attenuated microvascular coagulation abnormalities and thrombosis in the lung [40, 41]. In a phase I study of patients with sepsis, pro-inflammatory markers were lower in patients who received intravenous vitamin C, as was thrombomodulin, a measure of endothelial injury . In another phase I study of patients with vasopressor-dependent sepsis, norepinephrine dose and duration and patient mortality were all significantly lower among patients who received high-dose intravenous vitamin C .
A recent large observational study found neurological dysfunction to be the organ dysfunction most closely associated with early and late mortality among patients with sepsis . Thus, interventions that are potentially neuroprotective should also be of interest. Vitamin C is one such therapy because of its antioxidant properties and its effects on the endothelium and blood–brain barrier. In an animal model of sepsis, treatment with antioxidants prevented the development of cognitive deficits at 30 days . Furthermore, it has been observed that patients with sepsis and low concentrations of vitamin C in the plasma and cerebrospinal fluid more often exhibit encephalopathy, suggesting compromise of the blood–brain barrier [46, 47]. Like vitamin C, thiamine is an essential micronutrient that is frequently low in patients with sepsis . Thiamine deficiency disrupts aerobic metabolism and, if severe, can lead to lactic acidosis and death. Furthermore, patients with septic shock and thiamine deficiency were recently demonstrated to clear lactate more quickly when given thiamine compared with similar patients who received placebo . Moreover, they exhibited lower mortality. Lastly, thiamine modifies the metabolism of vitamin C so that less oxalate is generated, thereby decreasing the likelihood of oxalate nephropathy [50, 51]. Hydrocortisone for relative adrenal insufficiency among patients with sepsis has been studied in randomized controlled trials and in systematic reviews [52, 53, 54, 55, 56, 57]. Although these studies provide inconsistent results with regard to the effect of hydrocortisone on mortality, corticosteroids are generally well tolerated and have been suggested to work synergistically with vitamin C to modify inflammatory mediators, increase catecholamine synthesis, improve endothelial function, and increase vasopressor sensitivity [17, 58, 59, 60, 61, 62, 63, 64]. The extent to which these interactions translate to a mortality benefit in the setting of sepsis is not known. The purpose of this clinical trial is to test the efficacy of vitamin C, thiamine, and hydrocortisone as a combined therapy in patients with respiratory or circulatory dysfunction (or both) resulting from sepsis. These patients, at the critical end of the sepsis spectrum, have been chosen because they are easily identified, have high mortality, consume significant critical care resources, and endure significant reductions in physical, emotional, and cognitive quality of life if they survive. Any improvements in outcomes attributed to effective therapies would be of great value to patients as well as care providers and health-care systems. Furthermore, because this therapy is composed of three inexpensive and readily available drugs, its efficacy would have immediate and dramatic implications in the management of sepsis in both well and poorly resourced settings worldwide. Funding for the Vitamin C, Thiamine and Steroids in Sepsis (VICTAS) study was extended by contract from a private foundation to Emory University, the sponsor of the study, with shared responsibility from principal investigators (PIs) at Emory University (JES, PI; DWW, co-PI) and Johns Hopkins University (RER, co-PI). 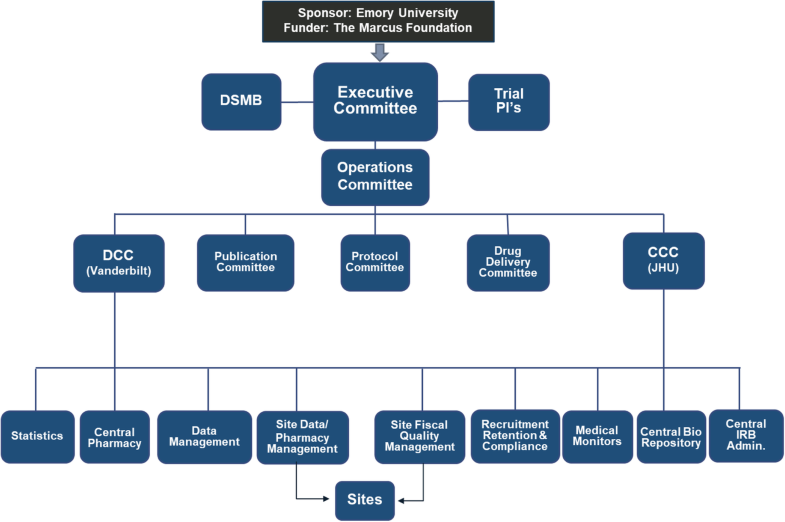 The PIs subsequently recruited an executive committee and operations committee composed of experts in sepsis, clinical trial design, and trial execution. Subcommittees were created to develop the study protocol, plan for drug and placebo acquisition and delivery, construct a standard operating procedure for the use of data acquired during the study, and oversee the writing, authorship, and dissemination of study-related manuscripts (Additional file 1). Clinical Coordinating Center (CCC) and Data Coordinating Center (DCC) responsibilities were delegated to Johns Hopkins University and Vanderbilt University Medical Center, respectively (Fig. 1). Briefly, the CCC was assigned the responsibility of shepherding the trial protocol through the central institutional review board (cIRB) located at Johns Hopkins University, recruiting and onboarding about 40 participating sites, monitoring protocol adherence, and organizing and maintaining a biorepository. The DCC developed and will maintain the electronic system for data capture (Research Electronic Data Capture, or REDCap) and will conduct final statistical analyses. The central coordinating pharmacy will also be located at Vanderbilt University Medical Center. Administrative organization of study. Abbreviations: CCC Clinical Coordinating Center, DCC Data Coordinating Center, DSMB data safety monitoring board, IRB institutional review board, JHU Johns Hopkins University, PI principal investigator. The VICTAS trial protocol was approved by the Johns Hopkins cIRB (IRB00164053). Any sites participating in the trial must formally agree to rely on this cIRB mechanism. The VICTAS trial is a prospective, multi-center, double-blind, adaptive sample size, randomized, placebo-controlled, clinical trial designed to investigate the efficacy of vitamin C, thiamine, and hydrocortisone (hereafter “treatment protocol” or “TP”) versus indistinguishable placebos (hereafter “control protocol” or “CP”) on the outcomes of patients with sepsis. Note that patients randomly assigned to the CP will be permitted to receive open-label steroids if prescribed by the treating clinical team. As such, patients randomly assigned to the CP compose a “comparator group” rather than a purely placebo group. Enrolled patients will be randomly assigned in a 1:1 ratio to the TP or CP. ◦ respiratory support requirement: acute hypoxemic respiratory failure defined as persistent hypoxemia—partial pressure of oxygen/fraction of inspired oxygen (PaO2/FiO2) of not more than 300 or blood oxygen saturation/FiO2 (SpO2/FiO2) of not more than 315—requiring (1) intubation and mechanical ventilation, (2) non-invasive positive pressure ventilation (NIPPV) via a tight-fitting face mask, or (3) high-flow nasal cannula of at least 40 L per minute with an FiO2 of at least 0.40. ◦ vasopressor requirement: a continuous infusion of norepinephrine, epinephrine, vasopressin, dopamine, phenylephrine, or other vasopressor agent at any dose for more than 1 h and required to maintain a mean arterial pressure of at least 65 mm Hg despite intravenous crystalloid resuscitation of at least 1000 mL. inability or unwillingness of subject or legal surrogate/representative to give written informed consent. Participating sites will be required to develop site-specific screening procedures to ensure the timely identification of potentially eligible patients. A brief summary of these procedures will be submitted to the CCC for review prior to site activation. All patients meeting study inclusion criteria will be recorded in the VICTAS screening log housed in REDCap at the DCC. Logs will be updated daily and “none” will be indicated if no patients meet inclusion criteria on a given calendar day. The CCC will review each site’s screening log at least once a month to identify the numbers of patients screened, those approached for consent, and the reason any patient may have been excluded. Screen failures will include patients meeting all enrollment criteria who are not identified in a timely way, those who decline to participate, those who are not approached because either they or their legally authorized representative (LAR) cannot be reached, those who consent to enrollment but are found to violate eligibility criteria prior to randomization, and those who are not approached because of the presence of any other exclusion criteria. Registered and credentialed study personnel will obtain consent directly from eligible patients with preserved capacity. When patients are not deemed capable of informed consent, the LAR will be approached as allowed by institutional standards and state requirements. When consent is obtained from an LAR, attempts to verify and obtain written consent from each patient for continued study participation is to be assessed regularly during his or her hospitalization. If consent is denied or withdrawn by either the enrolled participant or LAR, the participant will be withdrawn from the study. In addition to consenting to be randomly assigned to the TP or CP, enrolled subjects will be asked to “opt in” and (1) contribute to the establishment of a biorepository (accrued from a subset of participating sites) to assess inflammatory markers of sepsis and to establish a bank of specimens for future studies and (2) partake in an assessment of neurocognitive long-term outcomes (LTOs) which focuses primarily on cognitive and psychological functioning. This battery, composed of tests that are appropriate to employ via telephone, is relatively brief (~35 min) but rigorous and samples the various domains of functioning known to be affected by critical illness and sepsis . Participation in the biorepository and LTO assessments is not required for participation in the primary study. Participants will be randomly assigned to the TP or CP in a 1:1 ratio. The randomization sequence will be generated in R (version 3.4.3, R Foundation, Vienna, Austria) using permuted small blocks of random size, stratified by site. Study arm allocation will be operationalized via the use of pre-sorted drug kits. Once consent is obtained and inclusion and exclusion criteria are verified through the online REDCap portal, participants will be assigned the next drug kit in the sequence. Participants will be considered enrolled in the trial when assigned to a drug kit. The VICTAS trial received an Investigational New Drug exemption from the US Food and Drug Administration (FDA) in January 2018 on the basis of the off-label use of FDA-approved medications that meet the regulatory criteria for exemption (21 CFR Sec. 312.2(b) (1)). All three products (vitamin C, thiamine, and hydrocortisone) are commercially available and were purchased from McGuff Pharmaceuticals, Inc. (Santa Ana, CA, USA). The central coordinating pharmacy at Vanderbilt University Medical Center will receive all study drugs and matching placebos in their commercial formulation and packaging. They will then be labeled as investigational product, coded with unique identification numbers, and packaged into study kits. Contents for each kit (TP or CP) will be determined by the randomization sequence. Study kits will be labeled using unique, ordered kit numbers. Numbered kits then will be shipped to investigational pharmacists at participating VICTAS sites. Each kit contains two boxes, both labeled with the kit number. Box “F” contains vitamin C or placebo and requires refrigeration at 2–8 °C. Box “RT” contains thiamine hydrochloride and hydrocortisone sodium succinate or matching placebos and will be stored at ambient temperature (20–25 °C). Upon unsealing boxes F and RT, site pharmacists will be unblinded to study arm allocation but are prohibited by protocol from informing anyone of study drug assignment. Randomly assigned subjects will receive either study drugs or matching placebos. All study drugs and placebos will be administered intravenously every 6 h until a total of 16 administrations have occurred over 96 h or the patient is discharged from the ICU, whichever occurs first. Active agents include vitamin C (1.5 g), thiamine hydrochloride (100 mg), and hydrocortisone sodium succinate (50 mg). Patients will receive the first dose of study drugs, or placebos, within 4 h of randomization. All subsequent doses should be given every 6 h according to the standard every 6 h medication administrtion schedule used at each participating site. All drugs are to be administered separately and should not be infused simultaneously through the same line with any other medications. Thiamine and hydrocortisone will each be administered as an intravenous push, and vitamin C will be administered as a 30-min infusion. The same procedure will be followed for matching placebos. In patients who receive open-label corticosteroids by the clinical team at a total daily dose of at least 200 mg of hydrocortisone (or equivalent), hydrocortisone or matching placebo will be withheld by the investigational pharmacy. If the clinical team discontinues open-label steroids, hydrocortisone or placebo will resume until the patient completes the 96-h intervention period or the patient is discharged from the ICU. Other than the administration of study drugs, all management of randomly assigned patients will be at the discretion of the clinical team and according to local protocols. This includes fluid resuscitation, antibiotics, vasopressor titration, mechanical ventilation and ventilator weaning strategies, blood transfusion, nutrition, renal replacement therapy, and delirium management. Although glycemic control will also be managed by the clinical team and local protocols, it has been demonstrated that many point of care (POC) glucometers generate falsely elevated readings in the setting of high concentrations of intravenous vitamin C [66, 67, 68, 69]. To avoid the possibility of missing clinically important hypoglycemia or inadvertently causing hypoglycemia (with inappropriate insulin), participating sites will be required to measure glucose using either central or critical care laboratory devices or a POC device that has been validated in the setting of high plasma concentrations of vitamin C .
Enrolled patients will be evaluated clinically and by laboratory assessment at the time of randomization, on days of study drug or placebo infusion, at ICU discharge, and at hospital discharge or day 30, whichever occurs first (Table 1 and Fig. 2). Baseline data will be obtained as close as possible to the time of randomization and will include patient demographics, anthropometrics, source of hospital and ICU admission, health-care location (ED or ICU), comorbid conditions, presumed source of infection, antibiotic therapy, vital signs, level of respiratory support, vasopressor use, and clinical laboratory data when available and as needed to calculate the Acute Physiology and Chronic Health Evaluation II (APACHE II) and Sequential Organ Failure Assessment (SOFA) scores [71, 72]. Additionally, sedation level according to the Richmond Agitation and Sedation Scale (RASS) will be recorded, as will the presence or absence of delirium according to the Confusion Assessment Method for the Intensive Care Unit (CAM-ICU) [73, 74, 75]. On subsequent calendar days, clinical and laboratory data from 8 a.m. (or as close as possible to 8 a.m.) will be collected according to the schedule of events (Table 1). hCentral research labs will be collected at designated sites only. Overview of study progression. Abbreviations: CAM-ICU Confusion Assessment Method for the Intensive Care Unit, DC discharge, ICU intensive care unit, SOFA Sequential Organ Failure Assessment. For patients contributing to the biorepository, blood and urine samples will be obtained immediately prior to the first doses of study drugs or placebos on calendar day 1 of the study and 30 min after the first administrations are complete. 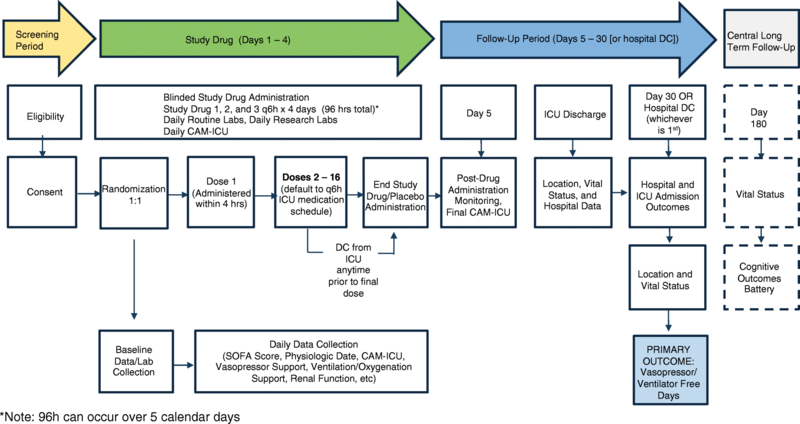 Provided that the patient remains in the ICU, one additional collection of blood and urine per day will occur within 1 h prior to any study drug or placebo administration on calendar days 2 through 4. All specimens collected will be de-identified and associated with each patient by using a unique identifier. Patients who agree to participate in the LTO sub-study will be contacted by phone at 180 days following randomization and undergo a validated and sensitive telephone-based neurocognitive assessment . We will rely on well-established methods honed across other studies of cognitive outcomes in ICU survivors to ensure high follow-up rates and patient engagement . All neurocognitive assessments will be carried out by neuropsychology coordinators at the Vanderbilt University LTO Coordinating Center to ensure consistency in approach and administration quality. The primary outcome for this trial is the number of consecutive days free of both ventilator and vasopressor support (VVFD) during the 30 days following randomization, recorded to the nearest calendar day. Patients who die at any time during the 30-day window score zero VVFDs. Patients who return to ventilator or vasopressor support will have the VVFD count reset to zero days so that ventilator- and vasopressor-free days accrue only from the last day the patient was free of both ventilator (including NIPPV and high-flow nasal cannula as per enrollment criteria) and vasopressor support. There are two mechanisms by which VVFDs may be increased among patients randomly assigned to the TP relative to the CP. First, the TP may reduce deaths. Second, it may reduce the number of days spent on respiratory or cardiovascular support among those subjects who do not die. Thus, there may be benefit in mortality, speed of recovery, or both, each translating to an increase in VVFDs. The key secondary short-term outcome is 30-day mortality. Additional short-term outcomes to support efficacy include ICU mortality and ICU and hospital length of stay. Exploratory outcomes include ICU delirium and renal replacement–free days at day 30. Any changes in SOFA score during the 96-h intervention period will be characterized. Blood and urine specimens from the VICTAS biorepository will be used to characterize (1) baseline levels of vitamin C and the pharmacokinetics of vitamin C during sepsis, (2) biomarker signals associated with sepsis progression and response to therapy, including procalcitonin, C-reactive protein, and F2 isoprostane (a reliable and sensitive biomarker of oxidative stress), and (3) the performance of emerging molecular technologies for sepsis diagnosis and prognostication. Important LTOs at 180 days following randomization include vital status and neurocognitive status among survivors. Neurocognitive status will be characterized with a wide array of standardized telephone-based cognitive, mental health, and functional assessments as described previously (Table 2) [77, 78, 79, 80, 81, 82, 83, 84, 85, 86, 87]. For the purposes of this study, adverse events (AEs) and serious AEs (SAEs) are defined in accordance with the guidelines of the US Office for Human Research Protections . An AE is “any untoward medical occurrence in a human subject, including any abnormal sign (e.g., abnormal physical exam or laboratory finding), symptom, or disease” and occurs during a subject’s participation in research . Expected AEs are those that are anticipated in the population under study, regardless of participation in research. Examples of expected AEs in this study include respiratory failure, thromboembolic disease, arrhythmias, delirium, anemia, coagulopathy, hypoglycemia, and death. Both expected and unexpected AEs will be considered study-related events, and thus reportable, if they are thought by study investigators to be related to study procedures or lead to discontinuation of study interventions. is determined to be an important and significant medical event that could jeopardize the subject’s health and could require medical or surgical intervention to prevent one of the five outcomes listed above. All unexpected or research-related AEs and SAEs as well as PAAEs will be reported to the DCC electronically through the REDCap system. AEs and PAAEs will be summarized at quarterly intervals for data safety monitoring board (DSMB) review and as needed for IRB continual renewals. Unexpected SAEs that are determined to be definitely or possibly related to the study will be reported by the site investigator to the DCC within 72 h. These events will be reviewed by the DCC and may be reclassified as PAAEs or—if confirmed as a true unexpected, related SAE—forwarded with supporting materials to an independent medical monitor at the CCC for further review. Events that are deemed to be unexpected SAEs and definitely or possibly related to the study will be reported to the DSMB chair as required by the DSMB charter. All unexpected related SAEs will also be reported to the cIRB at Johns Hopkins University in accordance with reporting requirements and may also be reported to participating sites if required. In the event of a significant safety concern related to study drug administration, including any unanticipated drug interactions, the site PI should evaluate the situation and determine with the clinical team whether discontinuing the study drugs is warranted. Because there are no specific antidotes for vitamin C, thiamine, and hydrocortisone, simply discontinuing the study drugs is appropriate. However, the study medication blind will not be broken, as doing so will not provide increased safety. Data and safety monitoring will be conducted by an independent DSMB to ensure and maintain the scientific integrity and ethical balance of human subjects’ research and to protect subjects from avoidable harm. As detailed in its charter, the VICTAS trial DSMB will be composed of five individuals: two emergency medicine clinicians, two critical care clinicians, and one statistician. These individuals will be selected on the basis of their content expertise in sepsis, critical care, multi-center clinical trials, and adaptive trial design and implementation. The DSMB will meet at least twice a year until study completion and will report to the VICTAS executive committee. The DSMB will act independently of the funder and sponsor of the study and is charged with ensuring that the trial is implemented as designed and that the pre-specified design continues to be scientifically and ethically appropriate, and the DSMB will review ongoing safety data. All data, unredacted source documents, and regulatory documents will be uploaded to REDCap and securely maintained by the DCC in electronic form. The REDCap application supports remote, centralized monitoring of participant data with an integrated query process. Specific data points that support the enrollment of participants or patient safety or affect the outcomes of interest (e.g., inclusion/exclusion criteria, informed consent, SAEs, and vasopressor/ventilator-free days) will be thoroughly reviewed by a study monitor. The first and tenth participant at each site will be 100% monitored for accuracy. About 10–20% of all additional data points will be randomly monitored for accuracy. For any omitted data or data found to be inaccurate or inconsistent with the provided source or not backed up by a source record, the DCC will issue a query to the participating site. All such queries will be tracked by using a standardized data resolution workflow module in REDCap. In the event that a given site has several instances of non-compliance, a VICTAS project manager will conduct an on-site visit to create a corrective action plan. In addition, at the time of reporting and analyses, further verification of data will occur through the application of range (to confirm entered values are clinically possible values) and consistency (to confirm internal consistency) checks to the dataset. Any new queries will be resolved as for monitor-identified queries. All users of the REDCap system will receive required training applicable to each individual’s role in the conduct of the trial (e.g., data entry, uploading source, and regulatory documents). The completion of this training will be tracked and attested to by trainees, who at the same time will verify their commitment to the appropriate conduct of the trial and expectations for data accuracy and security. In the absence of phase II data to guide estimates, this trial uses an adaptive approach to determine sample size. To maximize the possibility of detecting a benefit if it exists, the study is powered to detect a moderate effect on VVFDs with a maximum enrollment of 2000 subjects while allowing the trial to stop early if a large VVFD or mortality benefit is observed. Interim analyses will be conducted by statisticians with expertise in adaptive design who will be provided the data needed by the DCC. Then the results of these analyses, along with the design-specified actions, will be provided to the DSMB. The DSMB will communicate these actions, along with any safety or study conduct recommendations, to the VICTAS executive committee. success on the mortality outcome if the trial enrolls the maximum number of subjects (PPmort, Max N). At early interim analyses, when 200, 300, and 400 subjects have been enrolled, if the predictive probability of finding a significant difference (with one-sided alpha set at 0.001) between study groups on mortality with the current number of subjects exceeds 90%, study accrual will be stopped for success, data collection on enrolled patients will be completed, and formal outcomes assessments will be conducted. There is no stopping rule for futility if fewer than 500 patients are enrolled. At later interim analyses, when 500, 1000, and 1500 patients have been enrolled, if the predictive probability of success on VVFDs if the trial were to enroll all 2000 subjects is less than 10%, the trial will be stopped for futility. If the predictive probability of success on both the VVFDs and mortality endpoints exceeds 95% on currently enrolled subjects, accrual will be stopped for expected success. If the predictive probability of success on VVFDs for currently enrolled subjects exceeds 95% but the predictive probability of success on mortality is less than 10% should the trial continue to enroll 2000 subjects, the trial will stop for expected success on VVFDs alone since detecting any mortality benefit is likely out of reach. If accrual is stopped for expected success due to either condition, the study will continue until all enrolled patients reach their VVFD and mortality endpoints, at which time the final analysis will be conducted. Thus, predictive probabilities are not used in the final analysis. We note that it is highly unlikely that we will stop the trial for success on mortality alone without also concluding success on VVFDs since VVFDs represent a combination of treatment effect on mortality (all deaths are recorded as zero VVFDs) as well as treatment effect on vasopressor and ventilator support dependence in survivors. These stopping rules are summarized in Table 3. The overall type I error rate for the trial is controlled at 2.5% (one-sided), and the early interims, when 200, 300, and 400 patients have been enrolled, are designed to conservatively spend alpha so that 2.4% remains for the analysis of 500 or more enrolled patients (Table 4). With these parameters and a 20% estimated mortality benefit, which is conservative compared with the 32% observed by Marik et al. , the study is very likely (approximately 97% chance) to stop at or before 400 patients if this large mortality benefit is real. The power estimates used for sample size selection if the trial progresses to 500 subjects and beyond were determined through clinical trial simulation and take into account both the primary outcome of VVFDs and the secondary mortality outcome (Additional file 2). A detailed statistical analysis plan will be submitted as an update. In brief, continuous variables characterizing each study group will be reported as means with standard deviations or medians with interquartile ranges. Categorical variables will be represented as frequencies and proportions. The primary outcome is VVFDs at 30 days, and 30-day mortality is the key secondary outcome. VVFDs and mortality will be tabulated by study group and presented graphically. The primary analysis will be performed after all enrolled subjects have completed follow-up. For subjects with missing data on the primary endpoint, a “last status carried forward” approach will be used. If a subject was last seen on ventilatory support (as detailed in inclusion criteria) or vasopressors or both, it will be assumed that the subject remained so at 30 days, and a value of zero VVFDs will be imputed. If the subject was last seen off respiratory support or vasopressors or both and is not known to be dead, it will be assumed that the subject remained so for the remainder of the 30-day period. A gatekeeping strategy is used to control type I error rate. If the trial stops for expected success on mortality after enrolling 200, 300, or 400 patients, the mortality outcome will be tested first using a chi-squared test with one-sided alpha of 0.001. If the mortality outcome is successful, VVFDs will be compared using a Wilcoxon rank-sum test with a one-sided alpha of 0.022. If the trial reaches N = 500 or more, indicating more moderate effects, the more sensitive VVFD outcome will be tested first using a Wilcoxon rank-sum test with a one-sided alpha of 0.022. The mortality outcome will be tested only if a significant difference is detected on VVFDs using a chi-squared test with a one-sided alpha of 0.024. Additional outcomes are ICU mortality, mortality at 180 days, ICU delirium, renal replacement–free days at day 30, ICU and hospital length of stay, and physical, emotional, and cognitive outcomes at 180 days. Comparisons between study groups will be made using chi-squared tests or the Wilcoxon rank-sum test, as appropriate. These tests will all be two-sided with no adjustment for multiple comparisons, although we will report the chance of a type I error. In further exploratory analyses, comparisons of primary, secondary, and exploratory outcomes between groups will be modeled using, for example, logistic regression for binary outcomes and proportional odds models for ordinal outcomes. All primary, secondary, and other efficacy analyses will be based on the intent-to-treat dataset with no modifications to the intention-to-treat principle; subjects will be classified as randomly assigned. A per-protocol analysis set will be generated for exploratory analyses. Subjects in the per-protocol analysis set must meet all inclusion and no exclusion criteria, receive at least four doses of study drugs or placebos, and have no major protocol deviations. Protocol deviations will be ascertained prior to unblinding. Our approach to using last observed status carried forward for estimating VVFD and mortality when they are not observed at 30 days ensures that we will not have missing data on the primary outcome and the key secondary outcome. For analyses involving modeling of these endpoints, multiple imputation techniques based on predictive mean matching will be used to overcome missingness in covariates. Exploratory and secondary outcomes may be missing. The set of patients with complete outcomes data will be included when comparing these between the TP and CP groups. We may also conduct sensitivity analyses by conservatively imputing missing outcomes. Protocol amendments, once approved by the cIRB, will be disseminated to participating sites and investigator teams by site managers at the CCC using direct communications as well as monthly webinars. In addition, updates will be posted to VictasTrialSites.org and ClinicalTrials.gov. The VICTAS trial has been organized to assess the efficacy of a combined regimen of intravenous vitamin C, thiamine, and hydrocortisone in patients with respiratory and cardiovascular compromise that is attributed to sepsis. Efficacy will be defined by either an early mortality benefit or a significant increase in the primary endpoint of VVFDs among patients randomly assigned to the TP. Importantly, VVFDs may be increased by a reduction in deaths or a reduction in days dependent on respiratory and/or cardiovascular support or a combination of the two. Other important outcomes of interest include ICU mortality, renal replacement–free days, ICU and hospital length of stay, ICU delirium, and changes in SOFA score over time. The VICTAS trial will also generate data to assess the relationship between sepsis and neurocognitive functioning and any potential mitigating effect the three-drug regimen may have on short- and long-term neurocognitive outcomes. Lastly, the trial will create a biorepository which will be used to characterize vitamin C pharmacokinetics and to measure standard and emerging markers of sepsis severity in general and in the setting of high concentrations of vitamin C.
The prevalence of sepsis worldwide and the high morbidity and mortality of this common syndrome speak to the importance of finding effective therapies. For this reason, the large mortality benefit reported by Marik et al. ; the benign nature of vitamin C, thiamine, and hydrocortisone; and the fact that all three drugs are readily available and inexpensive have fueled an intense enthusiasm for this therapy. This has resulted in the initiation of several phase I and II trials and the VICTAS trial, which arguably fits the definition of a phase III trial. Although the initiation of a phase III trial without phase II data is atypical and considered financially risky, it is not without precedent, especially in the pharmaceutical industry where it may be stimulated by competition . The VICTAS investigators are in the unique position of having been approached and supported by a funder who is determined to quickly assess the efficacy of the three-drug regimen and therefore has provided the resources necessary to organize and start the trial. 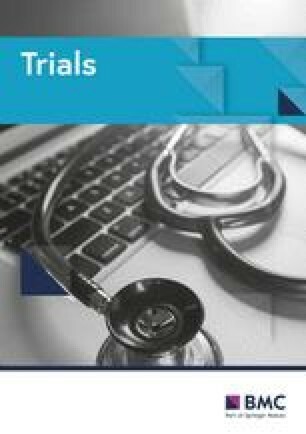 At the time of this writing, there are 17 randomized controlled clinical trials of the use of vitamin C in sepsis, in addition to the VICTAS trial, registered at ClinicalTrials.gov (accessed 10/4/2018). Of the four studies of vitamin C alone versus placebo that have been completed (NCT01590303, NCT01434121, NCT02734147, and NCT02106975), only one (NCT01434121), a study of pharmacokinetics and markers of inflammation, has been published . Of the studies that are ongoing or planned, two compare vitamin C with placebo (NC03338569 and NCT03680274), one compares vitamin C and thiamine with placebos (NCT03592277), two compare vitamin C and hydrocortisone with placebos (NCT03592693 and NCT03649633), two compare the three-drug regimen with hydrocortisone alone (NCT03333278 and NCT03540628), four compare the three-drug regimen with matching placebos (NCT03258684, NCT03335124, NCT03422159, and NCT03389555), and one compares the three-drug regimen with usual care (NCT03380507). The largest of these studies plans to enroll 800 subjects (NCT03680274). VICTAS has an initial planned enrollment of up to 500 patients and will possibly enroll as many as 2000 (NCT03509350). In addition, to our knowledge, VICTAS is unique in that the three-drug regimen is compared with a group in which open-label steroids are permitted. As a result, patients will not be prevented by protocol from receiving stress-dose steroids if their clinical team feels this treatment is appropriate. It is recognized that this may bias the results toward the null given our primary endpoint of VVFDs. However, in studies that do not allow the use of steroids in the control population, it may be difficult to attribute improvements in outcomes to vitamin C as opposed to steroids. An additional unique aspect of the VICTAS trial is the attention paid to neurocognitive outcomes. As has recently been reported, neurological dysfunction is the organ dysfunction most closely associated with early and late mortality among patients with sepsis and an extremely common and disruptive phenomenon among survivors of sepsis, even at extremely distal time points . The assessments of delirium while patients are receiving study drugs or placebos in the ICU and the neurocognitive assessments at 180 days will give insight into the hypothesis that individuals experiencing “less” sepsis have fewer short- and long-term cognitive deficits. In addition, the value of the three-drug regimen as a preventative therapy for these outcomes will be assessed. There are several limitations to this study, many of which are the result of limited phase II data. First, there are few previous data to guide sample size calculations. However, the use of interim analyses with pre-stated stopping rules allows the early recognition of a large mortality benefit, consistent with the recent observational pre-post data. In the absence of an early mortality benefit, the analysis refocuses on the more sensitive outcome of VVFDs to maximize the chances of observing an efficacy signal if one is present. Second, without phase II data, there is limited experience to guide the optimal dosing regimen for vitamin C. Therefore, a negative study could be consistent with an ineffective therapy or an ineffective dosing regimen. Although using the same total dose in all patients randomly assigned to the TP (as opposed to a weight-based dose) decreases pharmacy costs and simplifies the conduct of the trial, it will also result in some patients being exposed to substantially higher blood concentrations of vitamin C than others. Although the known adverse effects of vitamin C are rare and usually mild, the VICTAS dosing regimen may increase the likelihood of these events, especially in patients with lower body weights or impaired renal function. Third, owing to the inclusion of steroids in the TP, there is the potential for investigators and clinical providers to become unblinded because of otherwise unanticipated aberrations in serum glucose levels. Fourth, because the intervention group will receive the three-drug regimen, we will not be able to characterize which drug in the regimen is paramount. However, given the potential synergy between drugs, establishing the extent to which the combination affects outcomes has been prioritized. If a beneficial effect is observed, subsequent studies will be needed to determine the optimal dosing regimen and disentangle the effects of each component. Fifth, although the inclusion criteria for VICTAS are consistent with sepsis as defined by “The Third International Consensus Definitions for Sepsis and Septic Shock” (Sepsis-3) , they are also focused on respiratory and cardiovascular failure. Patients with sepsis based on abnormalities in other organ systems and without respiratory or cardiovascular organ dysfunction will not be enrolled. As such, the extent to which a beneficial finding can be applied to these subgroups of sepsis will not be known. However, regardless of this event, an individual patient meta-analysis of this and other contemporaneous trials (NCT03389555 and NCT03680274) comparing the use of intravenous vitamin C in patients with sepsis is planned (personal communication), increasing the likelihood that data obtained from patients enrolled in VICTAS will be informative. This protocol was developed in accordance with the SPIRIT 2013 guideline (Additional files 3 and 4) . As of January 9, 2019, the VICTAS protocol version is 1.4. VICTAS began enrollment August 22, 2018. It is estimated that up to 500 subjects will be enrolled by September 2019. If enrollment continues to the maximum enrollment of 2000 subjects, the estimated completion date is December 2021. The authors are deeply indebted to the following individuals for their administrative and scientific support of the VICTAS trial: Lindsay Eyzaguirre, Jessica S. Marlin, Caroline Rudolph, and Fred Sanfilippo, MD, PHD. Funding for VICTAS was provided by contract to Emory University, the study sponsor, by the Marcus Foundation. Neither entity had any role in the design, conduct, or planned analysis of the study. Neither entity has had any input on the writing of this manuscript, nor will they have any input on the writing of future manuscripts or decisions to publish data acquired in relation to this study. Nova Biomedical provided material support in the form of loaned POC glucometers to some participating sites. It was stipulated in the agreement between Nova Biomedical and Johns Hopkins University that sites being loaned glucometers would use only venous or arterial blood samples and not blood obtained from finger sticks. Otherwise, Nova Biomedical did not have any role in the design, conduct, or planned analysis of the study. Furthermore, Nova Biomedical did not have any input on the writing of this manuscript and will not have input on the writing of future manuscripts or decisions to publish data acquired in relation to this study. The contact at the sponsoring site is Jonathan Sevransky (jsevran@emory.edu). All authors participated in the design and writing of the study protocol. DNH drafted the manuscript. DNH, MHH, and GSM revised the manuscript on the basis of input from all other authors. All authors read and approved the final manuscript. The study protocol and consent form have been approved by a cIRB at Johns Hopkins University (IRB protocol number: IRB00164053). Prior to the activation of any participating site, the protocol approved by the cIRB will be reviewed by each site’s local IRB to ensure compliance with local standards and regulations. Similarly, the cIRB approved consent form will be reviewed locally by the IRB of each participating site and amended so that it is compliant with local standards and regulations. Potential participants or legally authorized representatives (if applicable) at each site will be approached by credentialed study personnel at each site to inform them of the study. Participants or legally authorized representatives (if applicable) will provide consent. EWE reports funding for the VICTAS trial to his institution from the Marcus Foundation and has received honoraria from Pfizer, Orion, and Masimo for continuing medical education activities (no speakers’ bureaus or stocks and so on). DNH, GRB, AH, JSH, JCJ, REM, and RER report funding for the VICTAS trial to his institution from the Marcus Foundation. CJL was named as co-inventor on patents related to risk stratification in septic shock. AM and KV are salaried employees of Berry Consulting, which is under contract with Emory University to support the design work and execution of the VICTAS trial. DWW reports the grant for the VICTAS trial to his institution from the Marcus Foundation as well as grants from the National Institutes of Health (NIH), the National Highway Transportation Safety Administration, the Department of Defense, NICO Corporation, and the Centers for Disease Control and Prevention. JES reports grants for the VICTAS trial to his institution from the Marcus Foundation, funding from the Biomedical Advanced Research and Development Authority, and a stipend from the Society of Critical Care Medicine to support his editorial position for the journal Critical Care Medicine. GSM reports grants for the VICTAS trial to his institution from the Marcus Foundation as well as grants from the NIH and Bristol-Myers Squibb to his institution. MHH, LWB, ABF, DFG, GDK and ML declare that they have no competing interests. Access to data: A de-identified dataset from participants in the VICTAS trial will be made publicly available about one year after publication of the primary manuscript. Dissemination and authorship policy: The VICTAS trial publications protocol (Additional file 1) will ensure the rapid and accurate translation of study results to the scientific, medical, and global community and maximize the scholarly productivity of the trial. The protocol will outline the steps needed for publishing data related to the VICTAS trial, including concept generation and submission, writing and analysis responsibilities, and authorship. Exploring vitamin C therapy in sepsis. : Jesse & Julie Rasch Foundation; [Available from: http://raschfoundation.org/projects/could-an-apple-a-day-keep-sepsis-away/. Accessed 1 Dec 2018.